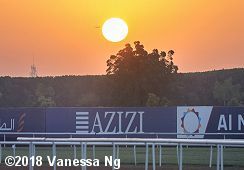 Sunrise over Meydan with an airplane coming out for the left side of the sun. 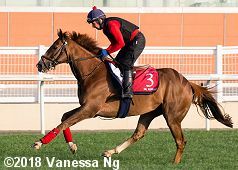 On Wednesday morning in Dubai, entrants for the $10 million Dubai World Cup (G1) and its rich undercard were at Meydan Racecourse on the main track. Conditions were typical for late March in the Emirates, with clear skies and temperatures in the low 70's during training hours before climbing to the high 80's during the day. The races will be run Saturday evening (Saturday morning in North America), with the World Cup going to post at 9:40pm local time (1:40pm ET). In North America the full card will be broadcast live on TVG in the U.S. and HPI-TV in Canada. In addition, NBC Sports Network will broadcast just the World Cup live from 12:30pm. Here are photos and comments for 13 horses that were out Wednesday morning. Please click the smaller photos to see a larger version. 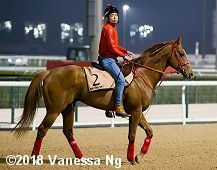 Awardee (Dubai World Cup) blew out 1/2 mile on the dirt track at Meydan with jockey Yutaka Take on board. "He moved nicely" Take said. "It was a good workout this morning. He looks well and he seems to have a good appetite. He runs more smoothly on the left-handed course. I have nothing to worry about his condition at the moment. He won't be a top pick, but should have a chance and I look forward to riding him on Saturday. He was a bit nervous when he was trapped on the rail last time, so I want to draw middle." Unfortunately for Take, he drew the rail. 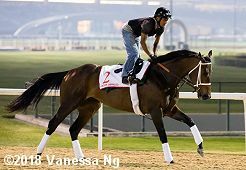 Forever Unbridled (Dubai World Cup) galloped 1 1/2 miles under exercise rider Pedro Velez. Trainer Dallas Stewart said, "She's handled the trip as good as any horse that I've been around" Stewart said. "She's won at eight different racetracks, but there are a lot of components that go into this. They van over here on race day because it's such a long walk from the barn, the race is at night. Just a lot of components. But, she thrives on getting ready for a race. The harder we pushed her in New Orleans this winter, the better she got. After the Breeders' Cup we just jogged her. We gave her plenty of time since that race, but she's never been out of training. She's galloped every day. If she gets a day off, she freaks out. She wants to be on the track. I didn't want to work her 1200m in January for a race in March, but I looked at my charts and made a schedule. She's had some just amazing works coming into the race. If I didn't think she was training good, I wouldn't run. I'd just take her back home. She's done great since she's been here." 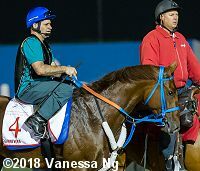 Gunnevera (Dubai World Cup) went out at 5AM with exercise rider Victor O'Farell aboard in order to gallop under the lights. He galloped 1 1/2 miles, blowing out the final 3/8 through the lane. Trainer Antonio Sano said, "He wanted to keep going. He went very, very well. He likes this track and he handled the lights really well. He came back strong, breathing normally. My horse is in good condition, and looking ahead, I need him to close strongly in the last part of the race. Now, I will pray. This race is very important to me, my wife, my family and my whole team." 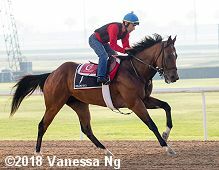 Pavel (Dubai World Cup) galloped twice around under exercise rider Amir Cedeno and then schooled in the starting gate. Leandro Mora, assistant to trainer Doug O'Neill said, "We asked him to go a little more strongly down the lane. He got to loving it. If we try it on a horse and he fights it too much, we just take it off" Mora said. "That's not American style, but we do it with two or three horses and it works. This guy loves it. He wants to be in the bit. I didn't really want to take him (to the gate) as he is brilliant in the gate, but he did what I expected which was go right in, stay, and then we took him out. Our horses, we teach them how to go to the gate so many times when they are babies, that by the time they go to the races that's their second house. We have my main man here (Cedeno), this is a family connection. Mario (Gutierrez) rides every one of our owner's (J. Paul Reddam) horses. He knows every single horse." Cloth of Stars (Sheema Classic) was in great spirit when he came onto the dirt track at the Meydan racecourse at 5am. 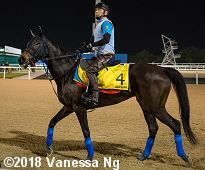 He was cantering behind stable companion Trais Fluors, who is going to run in the Dubai Turf, when he was doubled by a Japanese raider. As a consequence, he was very keen over the last half of the 7f workout. 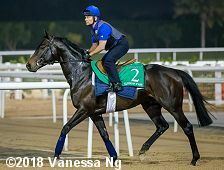 The pair had been watched by Lisa-Jane Graffard, the Godolphin representative, who said: "He is not the easiest ride and he got a bit lit up this morning, but Claude (his exercise rider) has a great relationship with him and has the measure of him." Sheikhzayedroad (Dubai Gold Cup) and Desert Encounter (Sheema Classic) gallop on the turf at 7:00am. Ian Russell, assistant to trainer David Simcock said, "'Sheikhy' has been here as many times as me. He just knows his job and really seems to excel out here. He loves the heat and the one-to-one attention that he can receive out here. It keeps him quite happy. He's a horse that gives you more than 100% and keeps on going. The French horse is very good, obviously, as is the Godolphin horse." Crocosmia (Dubai Turf) worked 3f over the dirt track this morning, setting easy fractions. "She has reached peak condition I think. She had good rhythm today," exercise rider Hiroya Kitazoe said. "Since she is likely to go forward we'd like a post somewhere in the middle or slightly more on the outside, but in the end if she breaks well she'll should go forward easily. We are really looking forward to this weekend." Matera Sky (Golden Shaheen) galloped once around. Jockey Yutaka Take said, "Matera Sky moved really nicely on the surface this morning. He's very sharp and has good acceleration. The start is key for him, but if he breaks well, he has a chance." 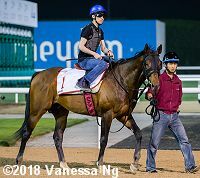 Ruggero (Al Quoz Sprint) had a brief gallop on the dirt track with the trainer Yuichi Shikato, who had just arrived at Meydan, supervising him. The 3-year-old colt clocked the last 200m in 12.1 seconds. "I am happy and he is in good order. The distance shouldn't be an issue for him. He is always relaxed, is not tense and is easy to control. I have told the rider to work for 1000m in around 70 seconds and stretch out in the last." Shikato said. "The field will be strong, so hopefully he can run his race." Dal Harraild (Dubai Gold Cup) galloped twice around the turf course. He comes here off a win in the totetrifecta Pick The 1,2,3 Conditions Stakes at Chelmsford on March 10. "He travelled over great and looks well," Chris Durham, travelling head lad to trainer William Haggas, said. "He's eating and drinking well and has really thrived off the heat here. It's all systems go for Saturday." Economic Model (Godolphin Mile) in front of the unique grandstand at Meydan. He was purchased privately by His Highness Sheikh Ahmed bin Rashid Al Maktoum following the horse's victory in the Hal's Hope Stakes (G3) at Gulfstream Park in Florida in his last start, and will remain in Dubai, however Chad Brown remains the trainer of record until Saturday. "Everything is fine and he's doing very well ever since we got here. I don't see any change in him at all," assistant trainer Guezel Cruz said. "It's amazing how well he's handled all of the travel and what we are asking from him. He's digging into the feed tub every day. I think he's sitting on a big race. Everybody expects that and I hope he runs well." 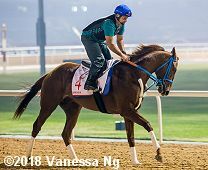 Holding Gold (Al Quoz Sprint) has competed at almost a dozen different racetracks in the United States and Canada but the Mark Casse trainee has yet to race on a straight course. "He's quite smart, so I do think he will handle the straight course," assistant Randi Melton said. For the first time Holding Gold is also being asked to run without the anti-bleeding medication Lasix. Melton said had that been a concern, Casse most likely would not have sent the horse here. In 2016 Casse took the great race mare Tepin to Royal Ascot, where she won without the medication. 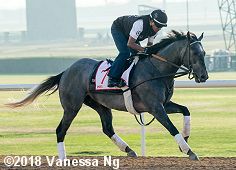 On Wednesday morning, Holding Gold was fine and a bit feisty when he went out on the main track to stretch his legs during his easy one-mile gallop. "He got keyed up some when a pair of turf workers passed outside of him heading into the lane. He then settled again nicely, but that did put him on his toes. But it was in a good way," Melton said.